Breaks down to only 47 lbs.! 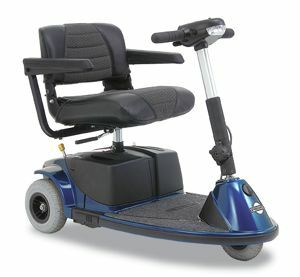 The newly redesigned Revo delivers "full-sized" scooter style, performance and features in a compact lightweight design that easily disassembles for transport while remaining highly affordable. The new Revo has innovative interlocking drop-in battery packs for easy removal/installation, making this the perfect scooter of choice for vehicle or airline transportation. The Revo seat offers height adjustment and swivel with flip up armrests for comfortable positioning. The Revo easily disassembles into 5 lightweight pieces (the heaviest weighing only 47 lbs.) in less than 2 minuets with no tools required. Innovative interlocking drop-in battery packs for easy removal/installation. Easily disassembles into 5 lightweight, easy-to-manage pieces. Height adjustable armrests and front and rear lights. Easily accessible charger port and circuit breaker. Built in carrying handles and grips for easy lifting. Weight w/o batteries 107 lbs.